The Giant Coot (Fulica gigantea) is a rail found in the altiplano (west-central South America, where the Andes are at their widest), from central Peru, through western Bolivia, to north-eastern Chile and extreme north-western Argentina. It is among the largest members of the coot family. It is 48–64 cm (19–25 in) long - including its tail, and weighs 4.5–5.3 lb (2.02–2.4 kg). 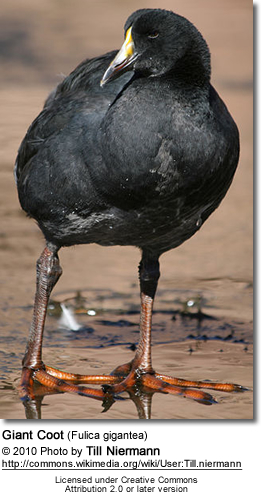 This heavy-bodied coot has a proportionally small head and knobs above the eyes. The plumage is mostly dark slate-gray with white on undertail feathers. The bill and shield are white, yellow and red. 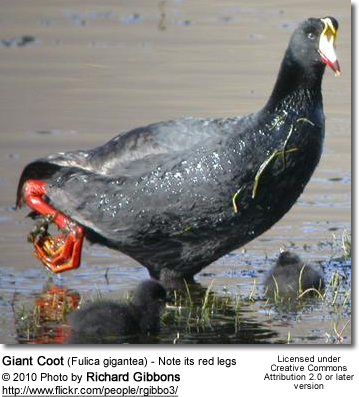 It's the only coot with red / reddish legs. Juveniles are dark dull gray, with paler underparts and dark bare parts. Adults normally too heavy to fly and are generally considered flightless. 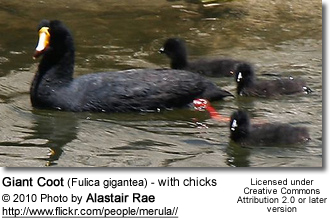 Giant Coots are monogamous and even outside the breeding season don't form colonies. They breed throughout the year, but mostly during the winter. Pairs build huge nests primarily made of aquatic vegetation in water c. 3 ft (1 m) deep, often resting on bottom of lake and 3 ft (1 m) wide and up to 10 ft (3 m) long at waterline, projecting up to 20 in (50 cm) above water. They reuse the same nest. The average clutch consists of three to seven eggs. The young fledge when they are four months old. These vegetarians feed from the water surface and occasionally dive. Their diet consists mostly of aquatic vegetation, and they also graze on shore.